All of us are probably experiencing problems with mobile phone using Android because of the speed of reacting to commands. This thing happens because there are many applications that your device is using without being necessary. These applications use data into the background and make your phone move very slow. There are many possible solutions for solving this matter. The most used are Task Managers or Task killer applications that are available in the Android Play Store and they can stop the unwanted processes from the background. 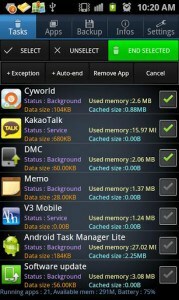 However, those applications can make your phone move even slower because they can’t control what applications to stop. Some of the processes are needed for a good functionality of the phone and you don’t really want to stop them. So, it is recommended to use Task manager applications that are trusted, or the default version of your Android if you don’t trust other. There are some very good instructions into the lines below. – Choose Settings from the App drawer found on your homescreen or access the quick shortcut to settings if you use a ICS device. – Then choose “Apps” from the list. – Tap “All” and you will see all your applications. – Choose the application that you want to stop and tap the “Disable” button and then “Ok”. – Now, the application is disabled and you can easily enable it following the same process and tapping “Enable”. The application will disappear from the App drawer and you will find it here again, after you enable it from the settings page. If you want to stop an application temporarily, you will choose “Force stop” button. To start it again, you will need to enable it manually.